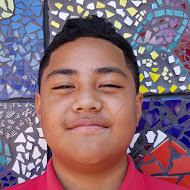 I am a Year 8 student at Pt England School in Auckland, NZ. I am in Room 1 and my teacher is Mrs Moala. Walt: write a narrative story. Start Writing here: once upon a time there was a big bulky guy called crash bash .He likes to play video games, and crush evil people. He only crushes people when someone makes him angry, or someone is on the run. He had an enemy called doctor professor. One day He went to the Shopping mall to buy some dinner, Then he saw a guy with a fork. He recognized He was doctor professor because no one else will steal from the shop. He ran outside the shop without paying. Doctor professor also recognized Crash Bash because Crash bash was Getting close to him. Doctor professor Was slowly walking away. “Hey” shouted Crash Bash. Zip!! Doctor professor Ran as fast as he can. Crash Bash Tried to catch him, But Crash bash got too tired. Doctor professor is so so fast. Crash bash runs his fastest ever. Somehow Crash Bash Was catching up. “Oh no how could he catch up’’ Said Doctor professor. “Crash Bash might be faster than me” Doctor professor thought. Crash bash grabbed His leg, and dragged him back to the shop. “is who you're looking for” said Crash bash. “ Yes Yes Yes” Screamed the shop cashier excitingly. Crash Bash stomped on Doctor professor, Scumf, Bash,Boom.BAM!!!. That was Crash bash’s first time saving the day. THE END. Task description: We draw ed a super hero in a paper for the art gallery. We had to write what its name and what power my power are super strength but somehow in the story my superhero now has super speed. Kia ora, malo e lelei, and talofa. My name is Kruz, and this year I am a year 8 at Pt England School. I am also only 11 years of age but turning 12 later this year. In the team 5 block we have 5 amazing teachers, Mrs Moala, Ms Tapuke, Mrs Tele’a, Mrs Stone, and Mrs Ilaoa. I have 5 siblings including me. I am in middle child of my siblings. I am also Samoan and Tongan. In my spare time I love to play the piano because it's relaxing. At school my favourite subjects are writing, and maths. I also love to play rugby in the weekends. My favorite foods are Kentucky Fried Chicken, and watermelon. I hope that you enjoy my blog, and also comment on the blog posts. WALT: work collaboratively to solve word problem Task Description: We Had to Figure out this question in a group.